The “Graston Technique” is a remarkable procedure that allows Dr. Lopez to detect and treat areas of “scar tissue” or adhesions in muscles, tendons and ligaments that can lead to pain and dysfunction. In the healing process our body attempts to repair muscles, tendons and ligaments with “scar tissue”, much like the scar that forms on the skin when you have scraped or banged your knee. As you can imagine, that scar tissue is not as strong and flexible as normal, healthy, undamaged tissue. Over time we can have a buildup of this fibrous scar tissue, particularly in the muscles, tendons and ligaments that get a lot of use. This can lead to pain and dysfunction because this replacement tissue lacks the strength and flexibility of healthy tissue (in some areas it may even mat down and entrap a nerve). The Graston Technique allows Dr. Lopez to detect and treat these areas because it uses a stainless steel instrument that glides along a patient’s muscle, tendons or ligaments and acts like a “scar tissue” stethoscope. When knots or bands of scar tissue are encountered, both the doctor and the patient sense a restriction or granular feeling. The instrument can then be used to “break up” this restriction or adhesion. Stretching exercises are then used to promote realignment of the fibers so that they behave more like normal, healthy tissue. 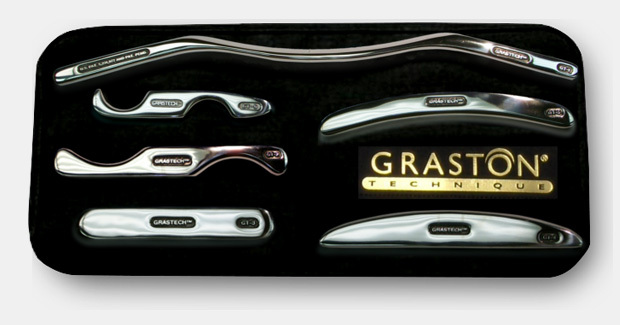 The Graston Technique is not appropriate for every patient condition. It is, however, very helpful for people with the most common conditions we treat in this office. If you have not experienced the Graston Technique and you still have lingering discomfort or stiffness, please ask whether you may be helped by this effective new treatment.